Now, successfully running an event for 49 years straight is a pretty impressive feat in itself, but what makes it even more impressive is that on every one of those 49 days, not a single drop of rain has put a halt to proceedings. Such is the popularity of this event, if you don’t get your entries in quick enough, you’ll straight up miss out. 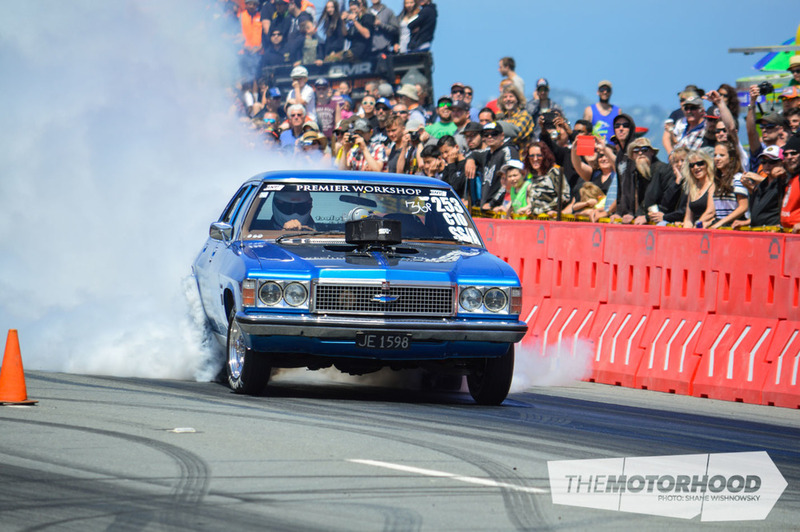 And missing out on this event is something you don't want to do if you want bragging rights to being the quickest street-legal car over a measured eighth mile on the road. As quickly as the entry forms are filled out and returned, the crowds of spectators file in through the gates at a similar pace. Fairly early on in the piece it was standing-room only at the barriers as everyone jostled for the perfect viewing spot to take in the day’s racing. 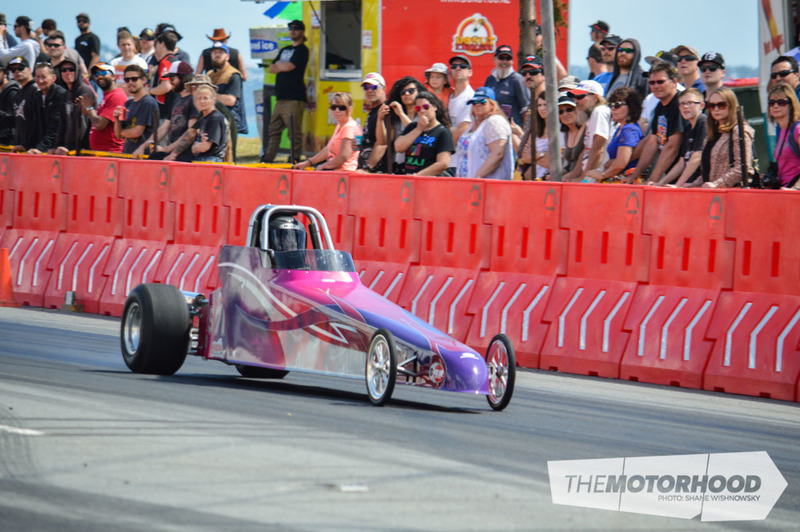 The aim of the game for any drag racer is to go as quick as you can and leave nothing on the table, but being safety conscious — remember, this is a road and not a drag strip — a lid must be kept on things. The quickest any competitor is allowed to run is 6.5 seconds; dip under this time and you will get one warning, and one warning only. Do it again and you are on the trailer. 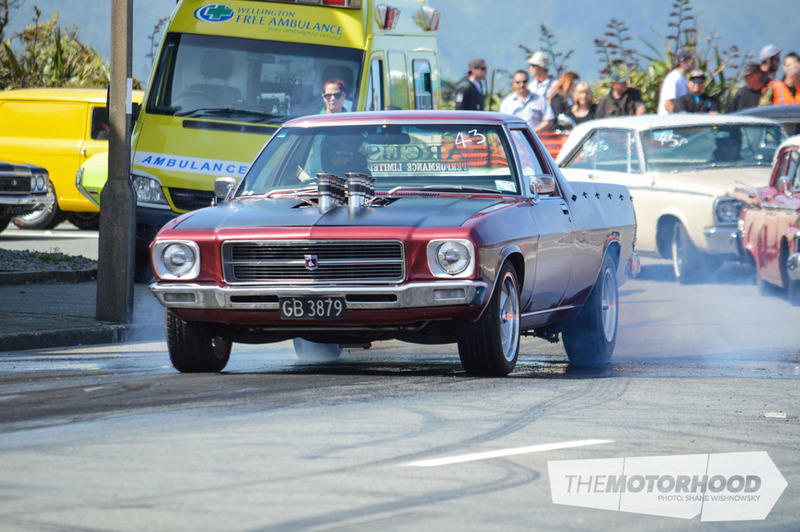 Whanganui’s Aaron Jackson has recently put his already tough Torana “on the little blue bottle”, and received one such warning during the morning’s practice rounds. There’s always one, isn’t there! Also keeping an eye on all things safety, the local constabulary were on hand to breath test everyone. Not even the junior dragster pilots escaped the long arm of the law. Once again there was not a positive result recorded — well done guys! 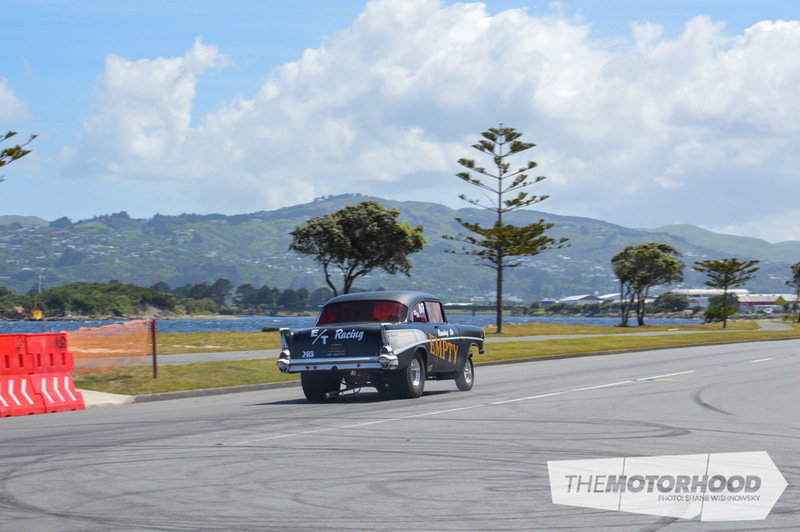 Over the course of the four practice rounds, the field was sorted into five brackets, ranging from 10-second cars in class five, through to the quickest of the quick — the 6.5-second cars in class one. 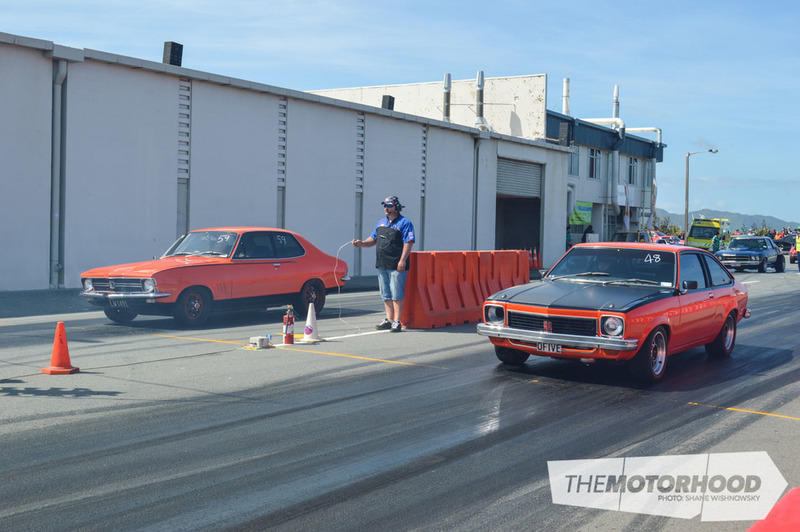 A quick jaunt through the pits confirmed an impressive line-up of tough street and competition cars. Standing out from the rest were Dan Southall, Aaron Jackson, and Darren Riches. 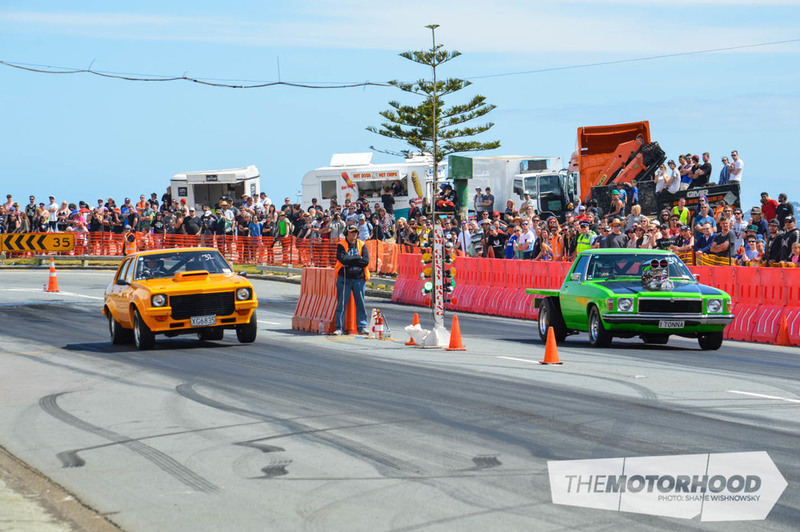 These guys all have cars that regularly run nines on the quarter, so it would be whoever could run as close to the ‘no faster than 6.5 seconds’ rule that would come up trumps. 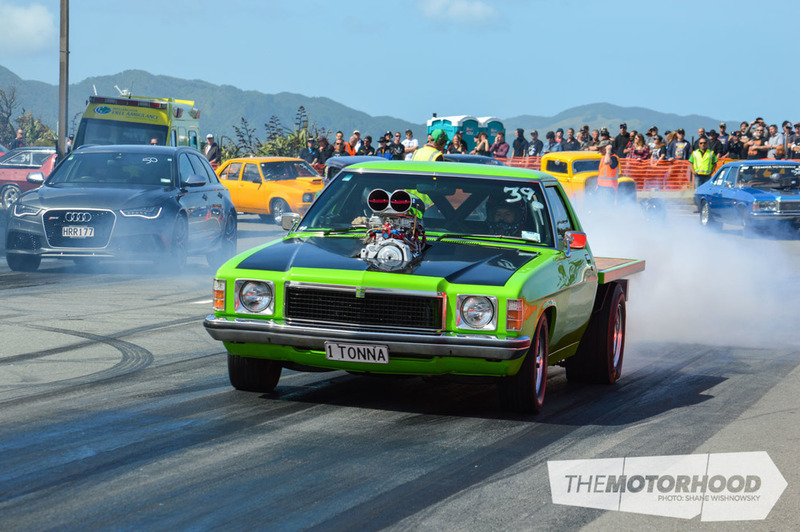 Turbos always get tongues wagging, especially when they come in pairs, and Brooke Teague has bolted a brace of them to his T-bucket. Still looking raw, the pressurized 283 has been stretched to 306 cubes, and is mated to a Jag rear end. The first timer was having a ball out there all day long! 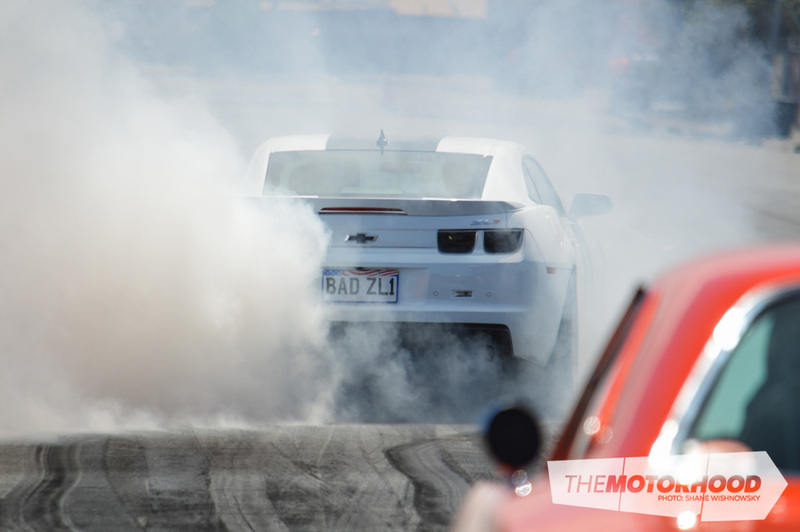 Dan Southall has recently made his already obnoxious Camaro even more mental by adding a Procharger. 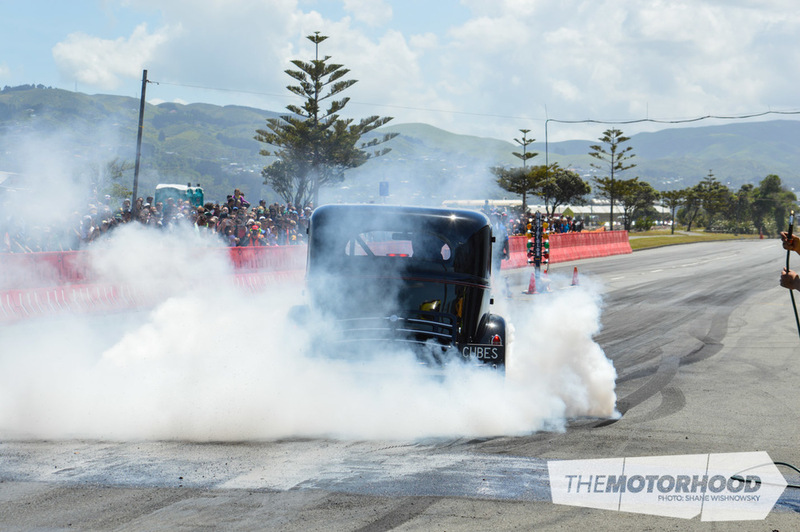 A couple of ‘instant fog’ burnouts, and an eighth-mile powerskid, which still produced a 6.9-second pass with zero traction, resulted in an oil leak and a fuel issue, putting them on the trailer for the day. This was a real shame, as this car will be one to watch once the teething issues are sorted. 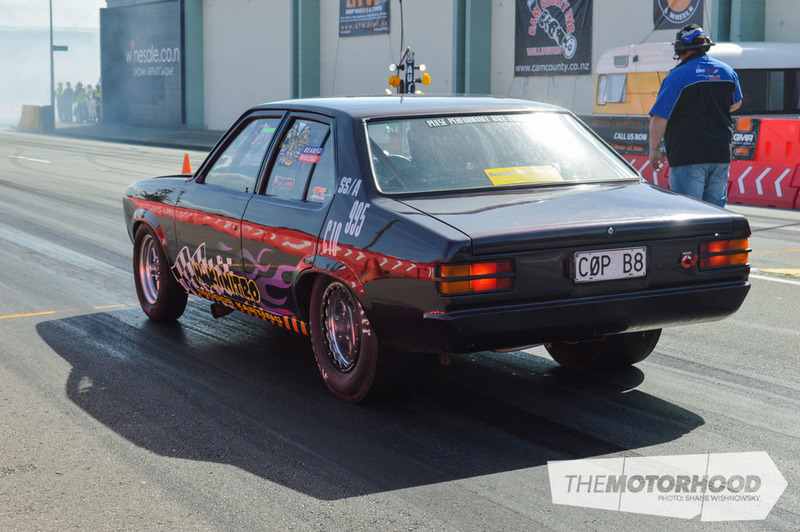 Also falling victim to race-day gremlins before the elimination rounds was last year’s runner-up, Todd Hall. 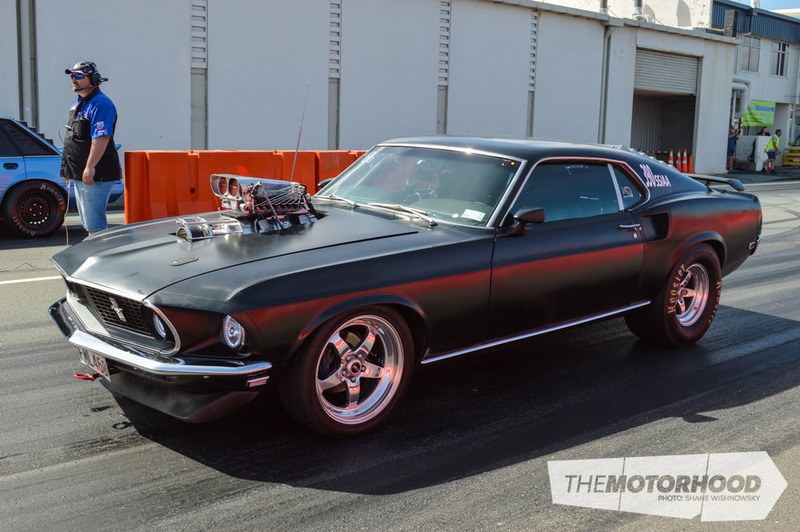 Unfortunately, an electrical issue reared its ugly head, sidelining the hard-charging Mustang. 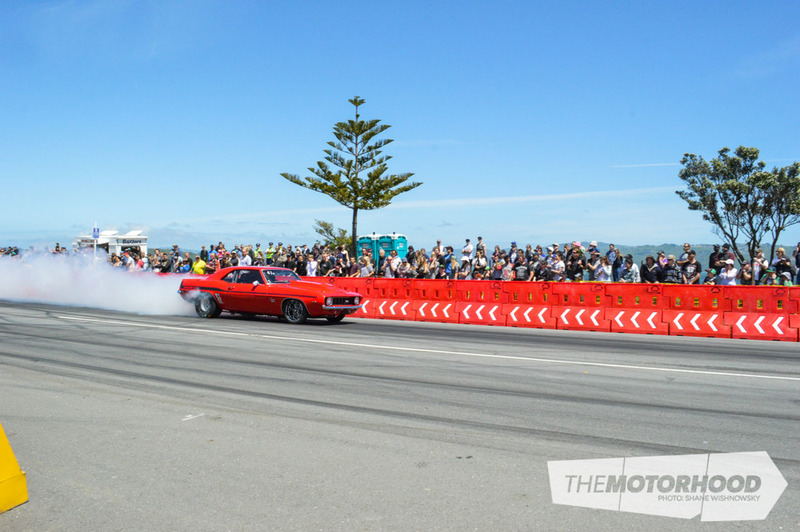 During the lunch break, the competition cars came out to play, giving the crowd a little taste of what full-on drag racing is like. 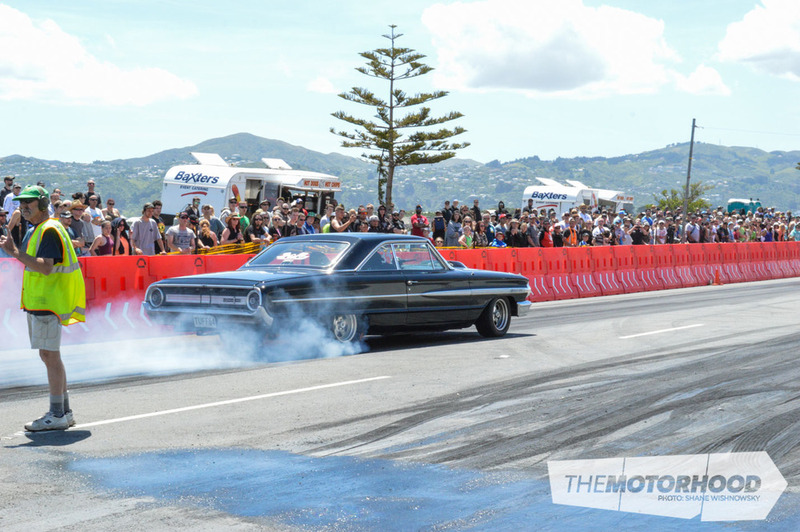 Josh Trybula creates a mega smokescreen, and boils the hides in his turbo big block Impala. 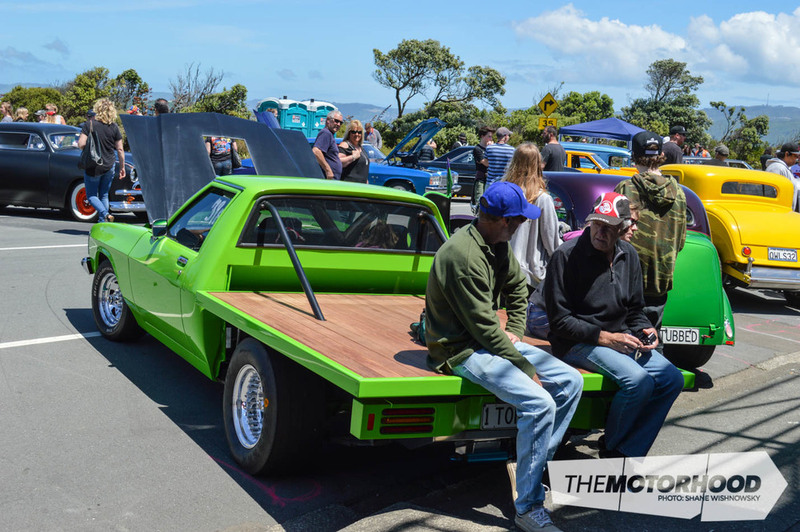 Sadly, after this top effort, oil made its way everywhere on the inside and outside of the car, and it was straight into the trailer following a lengthy clean up. 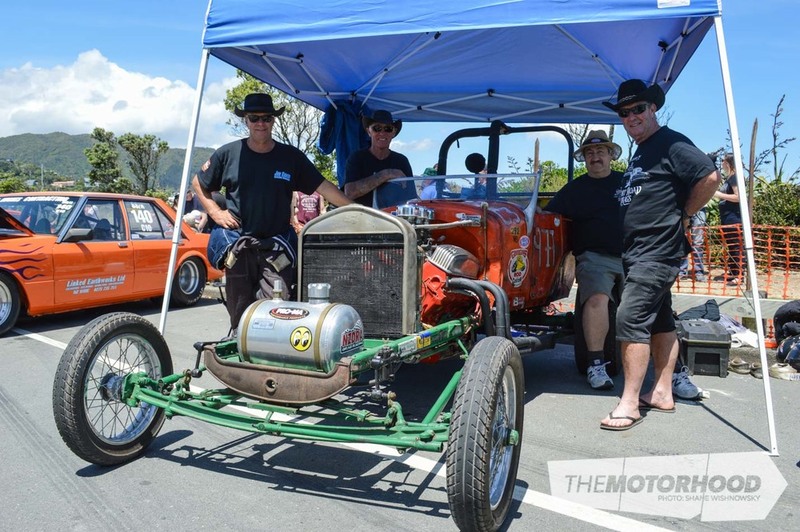 These four lads travelled down from Auckland with the late Colin ‘Shady’ Lane’s iconic T-bucket. Here, Brian Matthews, Andrew Gate, Scott Campbell, and helper for the day Ken Brown pose next to ‘Tom Slick’. 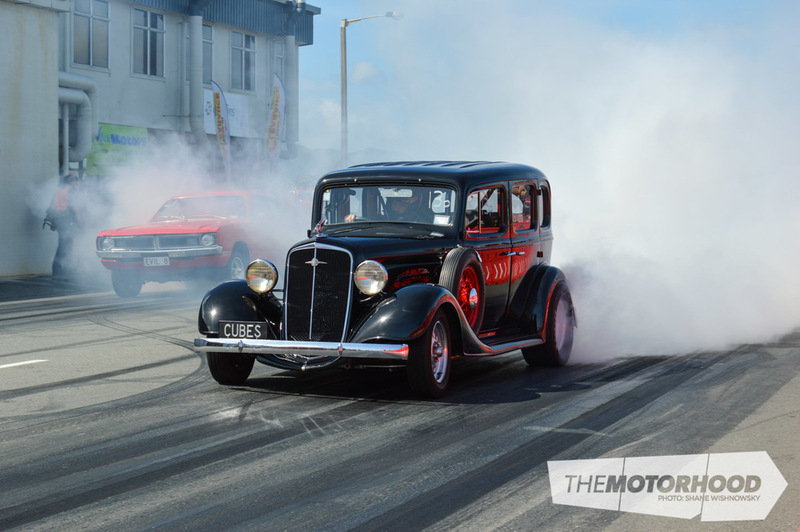 Unfortunately, the car’s other owner, Dave Page, was unable to make the journey and join in on the fun. The lads’ day was cut short when old Tom suffered rear-end damage after a wheels-up launch. 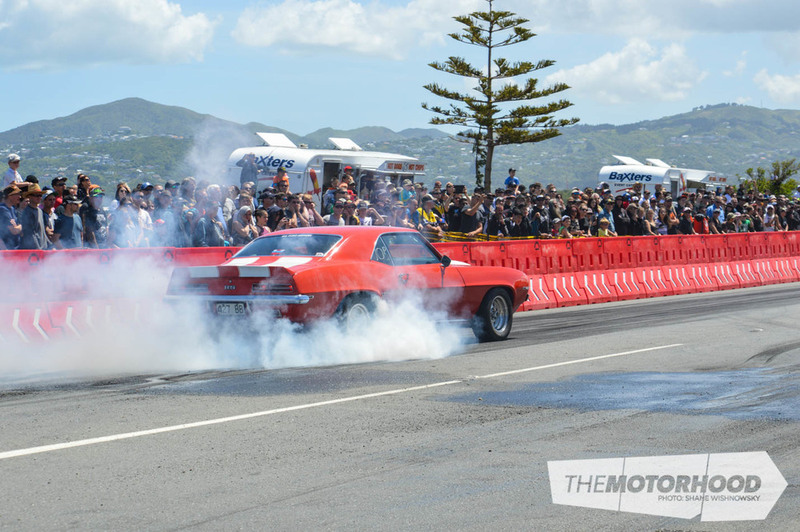 The eliminations commenced after lunch, with some close racing across all the brackets, and as the fields got smaller, the races got closer. When it came to the money rounds, the cream had — as predicted — risen to the top, with the eventual class winners deservedly taking hard-fought wins. 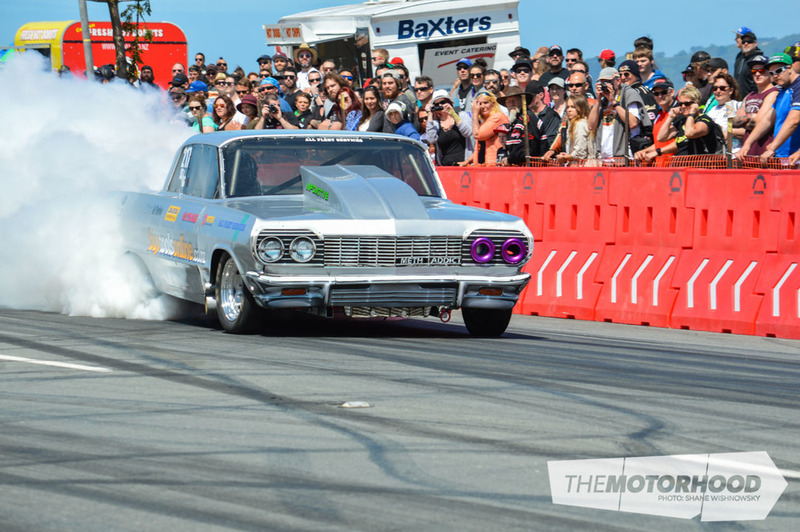 Next year will be the 50th Annual Port Road Drags, and if you want a great day out in the sun, and to be part of local drag racing history, then you’d best make sure you are in Wellington for that weekend. It’s going to be huge, and we can’t wait to be there! My first experience of the V8 engine was not a good one. Picture a white-haired young boy bawling his eyes out when an un-muffled sprintcar was fired up. My Dad, who had been car mad all his life, thought I was broken and he’d produced a dud! He persevered though and a few years later took me to Thunder Park; it was here that I fell in love with the V8 engine and I was hooked! 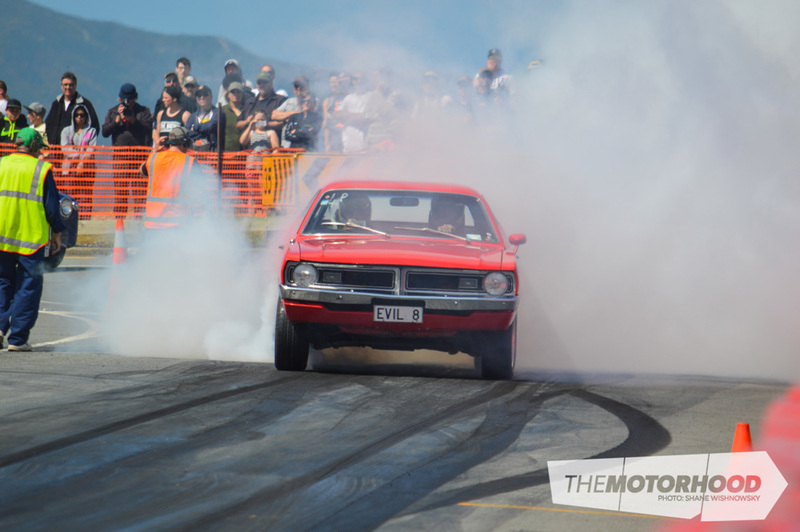 Since then I have been a regular on both sides of the fence at drag strips in the North Island, both as a spectator and a crew member. Never in my wildest dreams did I think that 40 years down the track I would end up photographing and writing about them, not that I’m complaining!